Europa is a large moon of the planet Jupiter. It is a little smaller than Earth's Moon and it is the sixth largest moon in the solar system. Europa's diameter is about 3000 kilometers. It probably has an iron core, and an atmosphere that's mostly oxygen. The surface is icy and very smooth. There are not a lot of craters, but there are some cracks and lines. Because the surface is so young and smooth, scientists believe that there is a liquid ocean under the surface, a so called subsurface ocean, and that it is kept warm by tidal heating. In other words, Jupiter's strong gravitational pull on Europa makes it warm. The moon Europa was found by Simon Marius in December 1609. Galileo Galilei first saw the moon in January 1610 (he did not know Marius had found it). Simon Marius was the one who had the idea of the name 'Europa'. The moon Europa is named after a princess from Greek mythology who became the first queen of Crete. However, people usually called Europa 'Jupiter II' until the middle of the 20th century. 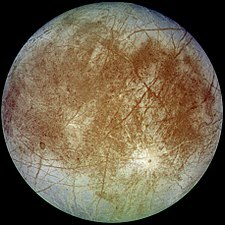 ↑ 2.0 2.1 2.2 2.3 2.4 2.5 2.6 "Overview of Europa Facts". NASA. Retrieved 2007-12-27. ↑ "JPL HORIZONS solar system data and ephemeris computation service". Solar System Dynamics. NASA, Jet Propulsion Laboratory. Retrieved 2007-08-10. ↑ Bills, Bruce G. (2005). "Free and forced obliquities of the Galilean satellites of Jupiter". Icarus 175: 233–247. doi:10.1016/j.icarus.2004.10.028. http://adsabs.harvard.edu/abs/2005Icar..175..233B. ↑ 7.0 7.1 Yeomans, Donald K. (2006-07-13). "Planetary Satellite Physical Parameters". JPL Solar System Dynamics. Retrieved 2007-11-05. This page was last changed on 22 April 2019, at 22:32.